Practices are on Thursday nights at 7:00pm, with anthems to prepare for every Sunday and festivals throughout the year. We welcome back Gary to the tenor section and Jackie to the sopranos! New voices always welcome. After a wonderful Lessons & Carols service we now look to Lent, Easter and the Bishop's visit. - Sunday morning warmup at 10:00am, we have an anthem every week. - Annual Choir Christmas Dinner Party was a terrific chance to relax after the busy season. Happy New year everyone. - Thursday night practice held at 7:00pm in the choir stalls, until early June when we break until Sept. We have completed some challenging music this year thanks to Paul's direction and look to the Bishop's visit in the spring. - We joined in the RCCO Harvest Hymn gathering in Harrow this past fall. 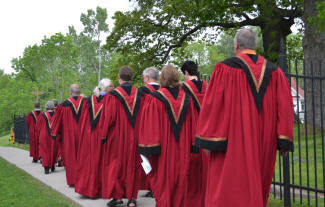 Our summer session excludes practices as we ask people both from within and outside the choir to share their musical talents with the congregation. We are led by our organist Paul Wharram as we prepare extra music at festival times and we love having guests. The choir is always open to new members. We are self sufficent for purchasing music and choir gowns while also financially supporting the parish. We assisted with the church sign, instrument tuning, and general parish funds. We sing music responses during worship; for example the Agnus Dei (Lamb of God) arrangement by Peter Nardone, also Lord Hear our Prayer and 5 fold Amen. This choir picture was taken once we received our new gowns. We have lost 2 members to cancer since that day, we will remember them. 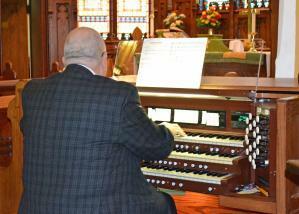 Organist Paul playing on our rebuilt organ. With the 3 manuals and full pedalboard, it includes a midi system and more recently chimes!